PRISON inspectors have raised concerns “from a human decency perspective” about the conditions women are held in at one of Scotland’s largest sheriff courts. HM Inspectorate of Prisons for Scotland visited Glasgow Sheriff Court as part of its examination of Cornton Vale women’s prison in Stirling. The inspectors went to the sheriff court as it manages the highest number of females from the prison. Inspectors branded the conditions inside the building “appalling”, saying women being taken from the custody unit to court had to pass male toilets which were “unscreened, odorous and clearly visible from the hallway, as were any individuals using the facilities”. The small number of holding rooms in the female cell area meant five or six prisoners were in each “which was far from ideal, especially given the number of women that they had to manage within this area with addiction or mental health issues”. The report went on to state that this area had only one toilet, which was behind a screen but not a door, offering “minimal privacy which was degrading and inhumane for all concerned”. On occasion, some of the women who were due to appear in court were held in cells with no call buttons for alerting staff, with the report stating: “Many of the women were vulnerable and may have been suffering from mental health or behavioural issues and an inability to attract the attention of staff was concerning. 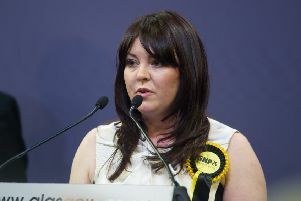 Liberal Democrat justice spokeswoman Alison McInnes said: “It is frankly scandalous that women are being held six to a cell, forced to go to the toilet in view of others and as a matter of routine made to walk past unscreened male toilets. A spokesman for the Scottish Courts and Tribunals Service (SCTS) said it is “committed to providing custody units that are up to standard while ensuring value for money for the public purse”. He added: “SCTS invests considerable sums on maintenance - more than £0.5 million on the last programme of repainting custody units alone - and has set protocols in place for regular and emergency deep cleaning of cell facilities.